What would it mean to you if you doubled your income—with the same number of customers? Think about how it would feel to give the same amount of effort and earn two, three, or many more times as much. 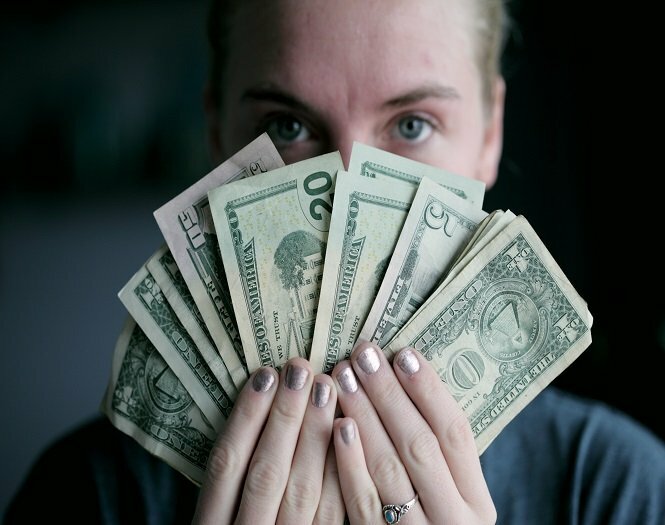 Last month, I conducted a training with a large software company and discovered their top rep, Trina, earns more than five times as much as the lowest performer in her company—while talking to the exact same number of customers. “Prior to reading your book,” she said, “I uncovered the customer’s basic information and problems, but, now, I dig much deeper. I find out what solving their problem means for them personally.” Her last client, she said was interested in her software package to help streamline processes and increase profits, but Brent, the 48-year-old CFO, wouldn’t pull the trigger. When they met a second time, Trina asked a deeper question. 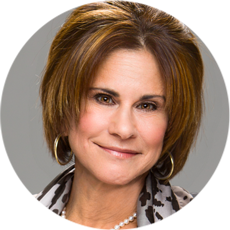 “What would it mean to you personally if you hit all of your KPI’s?” she asked. Trina won the largest deal of her career with one simple question. Are you asking surface level questions or are you getting to the heart of why people buy? 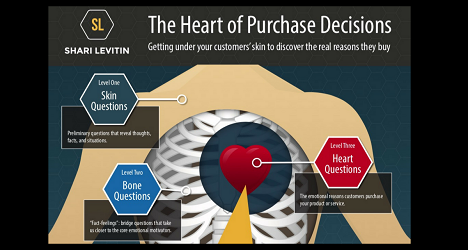 Getting to the heart doesn’t just work when selling direct to consumers. They, too, have underlying emotional motivators that drive their decision-making —whether it’s looking good to the boss, relieving stress, or building a more fulfilling work environment. These motivators may be hidden under the surface. It’s your job to uncover them and show how they’re connected to metrics like revenue, retention, and reputation. The best way to uncover buyer’s emotional motivators is to ask layers of questions: First Level, Second Level and Third Level questions. (I’ve recently named them SKIN, BONE and HEART questions). First Level or Skin Questions are surfacey. They reveal the customer’s current situation or the status quo. Skin level information is easily answered and is readily available on company websites and social networks. Have you used this type of program before? What/who do you use now? How many times have you (fill in the blank)? What accountability systems do you have in place to measure and monitor performance? What else do you measure? Why? How many employees? How much turnover do you have? Second Level or Bone Questions, uncover problems and they are a follow-up to your skin questions. Bone questions act as a bridge to the more powerful Third Level or HEART questions. If you could change anything about your current system what would it be? How much of a priority is this right now? What’s your worst experience with…? Are you looking for a quick fix or are you seeking lasting results? How big is the problem, on a scale of 1-10? Third Level or Heart Questions reveal the core motivator or what I call the customer’s Dominant Buying Motive. Why are you interested in this model? Why now? Why are you interested in engagement software for your employees? Why did you take that new position? How does this problem affect you personally? What do you feel you need to accomplish in your tenure here? Top performers, like Trina, ask such precise questions that the questions themselves make their customer’s view their businesses or their lives differently. When you ask “who, what, when, and where” questions, you will often get a First Level or SKIN level responses. “Why” questions, on the other hand, usually move the customer to Level 3 or into their HEART. Remember, when it comes to selling, the heart always comes before the head. If you’re on a team that inspires you or you’ve followed a boss who’s motivated you, you know that leader didn’t merely tell you how to do something; she inspired you to do it. It came from within. You were emotional about your commitment. So, whether you’re selling dance lessons, real estate, software, or life insurance, people buy on emotion and justify their decisions with logic after the fact.